The onset of winter sees the brewing of the annual Czech Pilsner here at the Effin Brewery. A classic beer style and nothing like a Euro Lager, with loads of malt and an incredible crisp dry bitterness. While I would usually use Weyermann Pilsner Malt, it has become exceptionally expensive, So I substituted Warminster Floor Malted Lager Malt. Quality is excellent and I am able to get it much cheaper. The Munich and melanoidin malts are there to provide the wonderful rich malty presence of a Czech Pilsner without the unnecessary complications of decoction mashing. Hop wise I had planned on being totally traditional and using 100% Saaz, but under ordered, so substituted Some Pacific Hallertau from New Zealand. Cracking hop, and a real complement to the Czech Saaz. Nice sunny day for once, and I decided to try out the new technique, (new to me that is), of underletting. 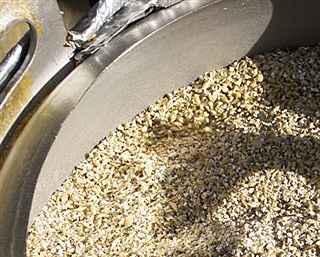 You put the grain into the tun and then add the mash liquor from underneath the false bottom . 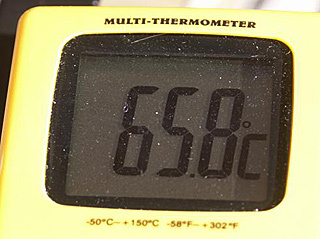 . . in theory this means that you get an even distribution of heat with minimal stirring. I was surprised at how easy this was to do, You can just see the liquor coming to the surface in this pic. I was half expecting to see the grain just float on top of the liquor, and with 15Kg of grain and 35L of liquor in a 50L tun that had the potential of being a complete mess. In practice it does work but not perhaps as well as described. I ended up with several pockets of drier more compacted grain when I emptied the tun which I would guess was the reason for my less than stellar efficiency . . . . lesson learned, do it in two batches next time, and stir between batches. Still I hit the mash temperature spot on . . . and I'm getting my water treatment right for Pale beers as the pH was 5.23, I added 15.4g of Calcium Chloride, and 1.0g of Magnesium sulphate to the 38L of mash liquor. As there is such a high hopping rate the last thing I wanted to do was boost the hop profile so chose calcium chloride instead of calcium sulphate. Picture at the top shows my old immersion chiller, which has about 15m of 8mm copper tube wound in two coils . 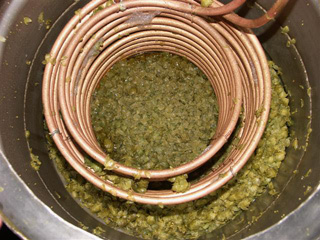 . . it does the job very effectively, but as I have two kettles I made another chiller this time from 20m of 10mm copper tube, again wound in two coils . . . slightly larger in dameter than the old one and very effective it is. Well 68L at 1.044 in the FV being brought down to 10C tonight and I'll pitch 80g of Saflager W34/70 tomorrow morning. . . . Its a bitter wort . . . but a lovely colour. I'm under gravity and under strength (Was aiming for 76l at 1.047) . 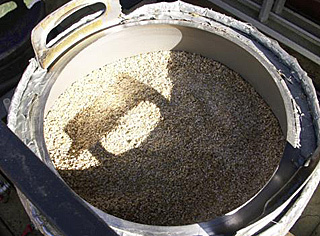 . . could be because of the underletting creating drier spots in the mash which were more dense than others so sparging was inefficient . 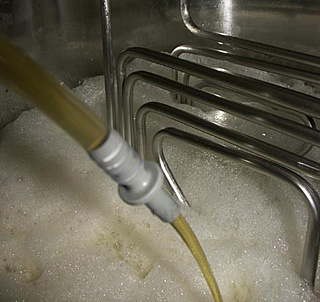 . . but also 490g of hops also absorb a lot of wort . 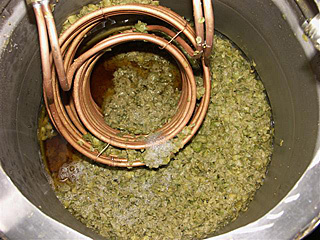 . . 8L is easily a possibility . . . . IIRC 1Kg of hops displaces 1L and absorbs 15L of wort in the copper . . . so there is my lost 8L . . . . . Hmm at 41IBU this could end up being a little bit over bittered . . . but then it will need to be lagered . . . So here is 800g of Saflager W34/70 being rehydrated in 800ml of boiled water cooled to 25C . . . The stir plate really makes this job easy. 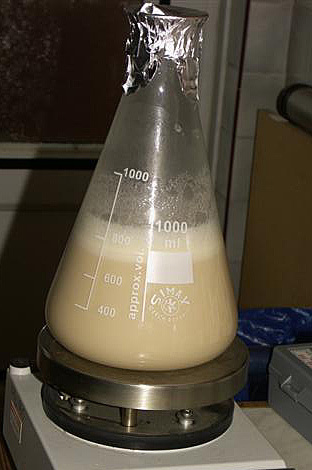 Unfortunately even 80g of yeast is not really sufficient for 70L of beer if you are going to pitch at 10C . . . You really need around 150g . . . another lesson learned. 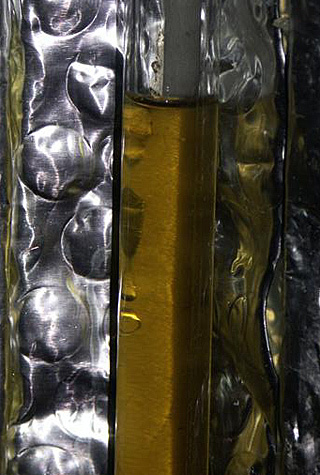 And here is the wort in the sight tube, a very nice colour, and clear.